My grandparents were married 65 years and my parents for 50, but I’ve been single most of my adult life. I finally did get married on my 39th birthday. My husband hadn’t been married before, but that doesn’t mean that he—or I, for that matter—came baggage-free. In addition to love and a good sense of humor, each of us brought to our union a fierce independence, die-hard habits, and more than a few quirks that are either intolerable or amusing depending on the day. The decision to say “I do” wasn’t easy for either of us. I’m still not sure why I stayed single into middle age, especially since I always knew I wanted to get married. It’s true I wasn’t interested in marriage in my 20s, trumped instead by a desire to travel the world and jumpstart a career, but by 30 I was ready. I dated a lot, had my fair share of boyfriends and trysts and their attendant tears and chocolate binges. I even threw a singles party in my condo when it was still a bold thing to do. I met someone there, we dated for four months, and then he ended it. Was it just bad luck? Did I have special radar for men afraid of commitment? Or was it some deeper fear or issue on my part? Perhaps all of the above. One would think I had good role models in my life for long-lasting relationships, which makes it even more puzzling. But of course a long-lasting relationship doesn’t necessarily mean a happy or healthy one. My grandparents were not unlike Millie and Irv in The Ninth Wife, particularly toward the end of their lives. They loved each other in many ways, but I’d often witness them devolve into cursing, screaming, hitting, and what looked to me like pure misery. I didn’t want what they had. I wanted what my parents had, at least what I was able to discern: love, devotion, respect, support, and true enjoyment. It’s not that I didn’t witness any of their loud arguments—just that, between them, all of the bad stuff seemed less significant. And yet I’ve always been aware that I don’t know the whole story of anyone’s marriage, particularly my parents’ and grandparents’. One evening when I was about 16, I was sitting on my parents’ bed with my mom watching a segment on 60 Minutes about infants born with birth defects. I must have said something like, “That must be so sad for new parents,” and my mom just said, “It was.” She then proceeded to tell me that, before I was born, she and my father had had another child who died at the age of three months. At the time my shock was mostly self-centered: I wasn’t the oldest child; I could have had a sister in a wheelchair; my parents weren’t whom I thought they were. But in the last ten years, I’ve thought a lot about the toll that must have taken on their relationship, wondering how exactly they made it through. Their explanation is “lots of therapy,” but that never felt wholly satisfying. One secret suddenly revealed meant there had to be more and for a long time I thought that if I could only unlock those secrets I’d understand how to choose the right husband and have the kind of marriage I always wanted, the kind that could withstand such tragedy. Novelists often write about subjects that get under their skin, and that’s certainly true for me. We pose questions, mull over various perspectives on the issue, hope for the occasional epiphany in the writing process, and finally open it all up for discussion. Good novels rarely provide definitive answers. There are various elements in The Ninth Wife that bear resemblance to other aspects of my life. My dad’s a banjo player/folk singer; I live in Washington, D.C.; I’ve been to Vietnam; I have a blue belt in Tae Kwon Do and my husband has a black belt. Likewise, there are a handful of ancillary issues in there that I’m always thinking about: identity and history, trust, family, death, the concept of home. 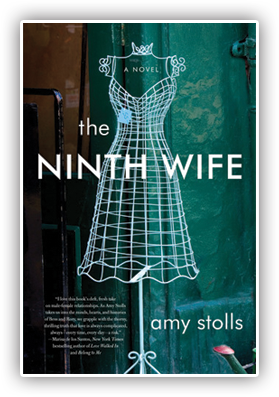 But I began The Ninth Wife when I was single and wrote the bulk of it as I was dating and then engaged to my husband, so what I wanted to explore most is marriage itself, in all its modern-day manifestations. Divorce rates in our country are unfortunately still high. I’m glad divorce has become an acceptable option, particularly for abusive marriages – in my grandparents’ day, it was so frowned upon that few had the nerve to abandon ship. But many among my parents’ generation turned that trend around and I got to wondering as I was writing The Ninth Wife whether my generation – as products of divorce; independent to a fault; skeptical of all the rhetoric and secrets swirling around the media and politicians and even, sometimes, our own friends and family; and faced with unending choices of mates on internet dating sites – that we’ve gone too far in the other direction. That is, I wonder if many of us abandon ship too easily (even before we get to the altar), too fearful of having to pull up our sleeves and do the hard work to investigate the source of the leaks, patch the holes, pull into port, and rebuild. Then we wake up years later still alone, still lonely. What is the best way to conquer our fears? How do we make a decision as life-altering as whether or not to marry the person we’re dating? I’m not sure. For me, I suspect it was a balance between gathering up as much information as I could – about my potential spouse, about marriage and what it meant to me, and about who I was deep down and what I really wanted – and recognizing that I couldn’t know everything, couldn’t know all the secrets of a healthy marriage until I tried it, that no one’s perfect, and that in the end it comes down to a leap of faith. We live in an interesting era of redefined family structures, of gay couples who are fighting for the right to be married and hetero individuals and couples who are perfectly happy not being married. Maybe there will be a time in our future when someone who’s been married eight times doesn’t seem all that unusual. Then I guess I’ll have to up the ante in the What If game. Something like this perhaps: You fall madly in love with a sensitive, supportive guy only to find out when he asks you to marry him that he’s part alien and wants to move back to his hometown on Pluto to take care of his ailing, scaly-green, two-tongued lizard-mother because, God forbid, she should be put into a nursing aquarium. What’s a single woman in love to do?